10 oz gold bars are beautiful fixed-weight bullion bars that represent a cost-effective way to buy gold for an investment portfolio. 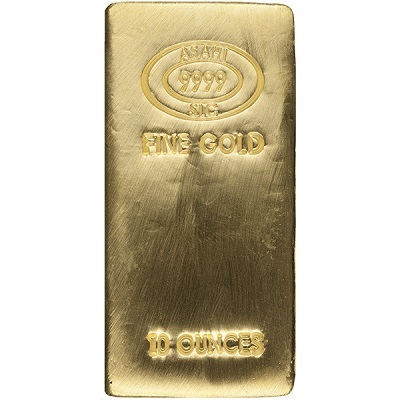 Each 10 oz gold bar contains approximately 10 troy ounces of 0.9999 gold bullion. The Hard Assets Alliance sources its bullion bars from a number of well-trusted precious metal refiners, all of which are accredited by the London Bullion Market Association (LBMA). Brands and appearance may vary from the picture above. If you are interested in buying gold bars for your investment portfolio, the 10 oz bar is a wonderful choice, as it is eligible for precious metals IRAs. This size gold bar is an excellent choice for retail investors looking to buy gold bars, because premiums over the spot price are low. Invest in a 10 oz gold bar today. The 10 oz Gold PAMP Fortuna bar is an elegant gold bar that will enhance any precious metals portfolio. Each Fortuna bar contains approximately 10 troy ounces of 99.99% pure gold. On its front, the bar shows a design of Fortuna, the Roman goddess of fortune and luck. On its back, the bar is stamped with its weight, purity, and serial number. The gold Fortuna bar benefits from PAMP Suisse’s exclusive Veriscan technology. This uses the metal’s microscopic topography to identify registered products. The bar comes enclosed in a clear protective case that includes an asset card, guaranteeing its gold weight and purity. The Fortuna bar is eligible for precious metals IRAs. Add the 10 oz Gold PAMP Fortuna bar to your investment portfolio today. 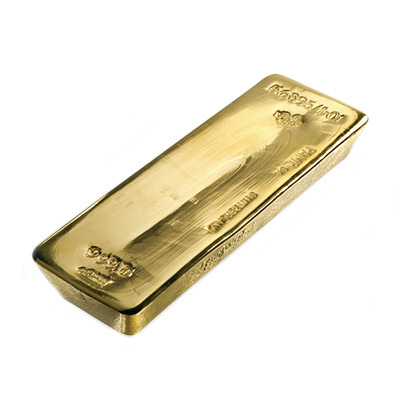 The 1kg gold bar is a fixed-weight bar designed for serious gold bullion investors. Each 1kg gold bar contains approximately 32.15 troy ounces of 99.99% fine gold. Every gold bar the Hard Assets Alliances sells is carefully selected from trusted LBMA-accredited refiners. Actual brands and appearance may vary from the picture above. 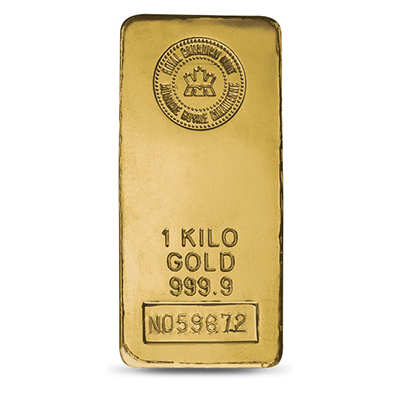 A 1kg gold bar can be included in a precious metals IRA. The 1kg bar is ideal for both institutional and retail investors that are looking for great value for their money. These bars are a cost-effective way buy large quantities of gold. Buy a 1kg gold bar online today. The 1 oz gold bar is a small yet attractive fixed-weight gold bar that offers a convenient and cost-effective way to acquire gold bullion. 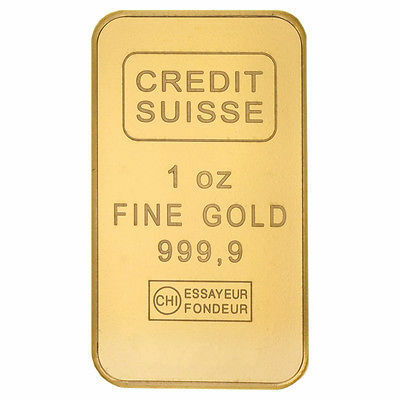 1 oz gold bars have a high purity of 99.99%. Each bar contains one troy ounce of gold. All our gold bars are carefully selected from highly regarded precious metal refiners, accredited by the London Bullion Market Association (LBMA). Investors should note that actual brands and appearance can vary from the picture above. If you are looking to buy gold bullion for your investment portfolio, a 1 oz bar is an excellent choice as 1 oz gold bars can be placed in a precious metals IRA. Buy a beautiful 1 oz gold bar for your investment portfolio today. 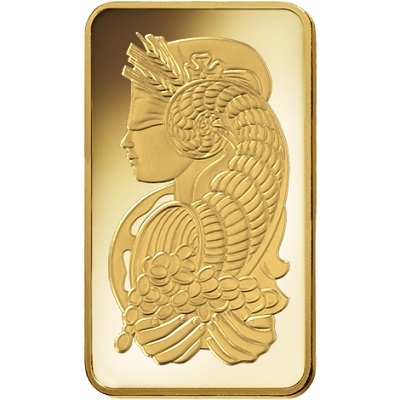 The 1 oz PAMP Fortuna gold bar is stunning bullion that is highly sought after. This bar has a 0.9999 purity and contains one troy ounce of gold. The front of the PAMP Fortuna bar is a beautiful design, which depicts the Roman goddess of fortune and luck—Fortuna. The bar is stamped with its weight, purity, and serial number on its reverse. The PAMP gold is embedded with unique Veriscan technology, which adds protection and peace of mind. Each PAMP gold bar comes with an asset card that details its gold purity and weight. The 1 oz Fortuna can be included in a precious metals IRA. 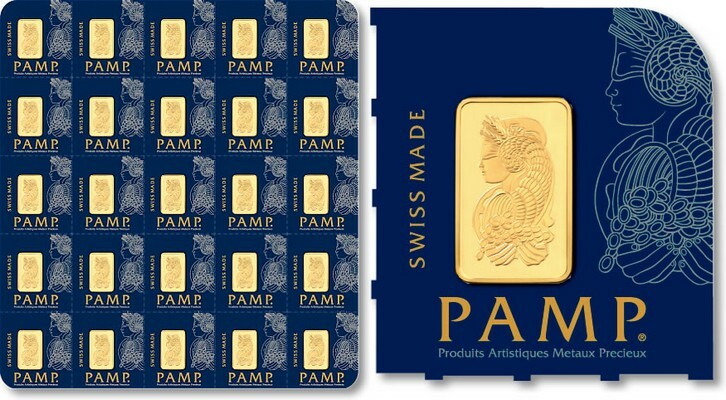 Buy a 1 oz PAMP gold bar for your collection today. 400 oz gold bars are the largest gold bullion bars available. These bars are variable weight bars and their appearance will vary depending on the refiner that made them. Favored by central banks, 400 oz gold bars are suited to institutional investors, industrial users, and ultra-high net worth investors. 400 oz gold bars contain approximately 400 troy ounces of gold, with purity of 99.9%. Each 400 oz gold bar is carefully selected by the Hard Assets Alliance from a number of trusted LMBA-accredited gold refiners. 400 oz bars offer an opportunity for serious bullion investors to acquire large quantities of the metal at a low premium to the spot price. They are IRA eligible. Add an impressive 400 oz gold bar to your investment portfolio today. The 25g PAMP MultiGram is a unique set containing 25 Fortuna ingots weighing 1 gram each. Each ingot contains 0.8038 oz of 99.99% pure gold. An extremely attractive collectible, the front of each ingot features Fortuna, the Roman goddess of fortune and luck. The back displays the weight, purity, and serial number. The PAMP MultiGram set is packaged ingeniously with interconnected CertiPAMP units that may be snapped off from the set as desired. When removed, each securely sealed ingot maintains its individual certification and unique identity. The 25g PAMP Multigram is a cost-effective and convenient way to acquire fractional gold bullion bars, and is eligible for precious metals IRAs. Add the 25g PAMP Multigram to your portfolio today. 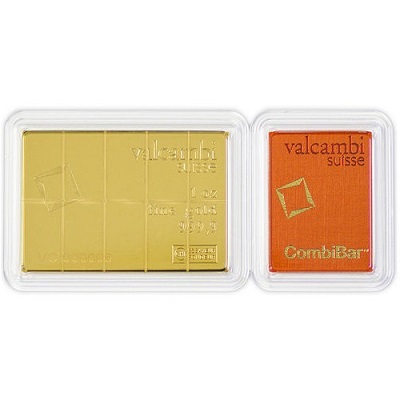 The Valcambi Gold CombiBar is a stunningly beautiful gold bar that is conveniently scored to separate into small bars. The CombiBar is presented as a single unit in a sealed protective assay package. Each 1 oz CombiBar can be divided into 10 one-tenth ounce bars of 99.99% pure Swiss gold. The attraction of this gold bullion bar is its flexibility, allowing easy division should you ever wish to trade parts of your investment. The CombiBar provides a cost-effective alternative to purchasing multiple smaller bullion bars and is eligible for precious metals IRAs. Buy the 1 oz Valcambi Gold CombiBar for your investment portfolio today.